Get instant access to renewable power anywhere you go. Wagan�s Solar ePower Cube is the ultimate portable power source. 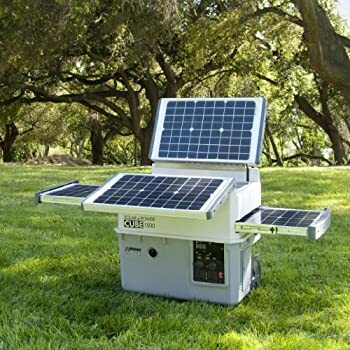 Simply charge the internal battery using its 5 total solar panels, which fold out from the top and roll out from each side, and you will have enough power to run your AC, USB or DC devices from anywhere. It can also be recharged with a home AC or vehicle DC outlet. The side of the solar power cube has a convenient fold out storage compartment, which is useful for additional accessories. Taking the cube with you is as easy as pulling a suitcase at the airport. Simply use the collapsible heavy duty handle and roll the all terrain wheels to your next sunny destination. This portable and renewable power source is extremely user friendly. 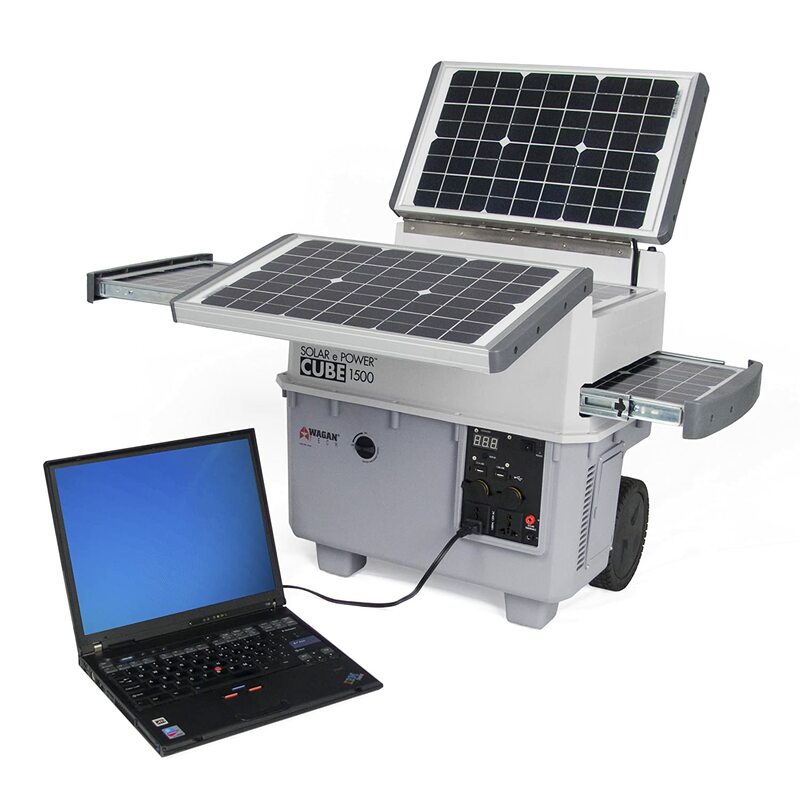 Unlike other solar products, this product is ready to use soon after it�s taken out of its box. It doesn�t require the user to assemble anything else or connect multiple parts. This simple all in one unit is ready to be used as soon as it is charged. 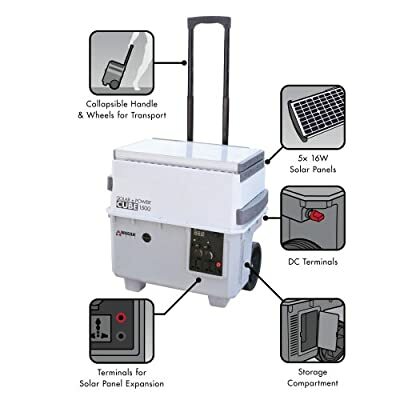 This Solar ePower Cube features a 1500 watt power inverter, two 115V AC outlets, two 12V accessory outlets for powering DC appliances, two USB power ports (5V 2.1 amp total), and a digital LED voltmeter display for checking battery status. Includes both AC and DC adapters to recharge the built-in 55 AH AGM/gel hybrid battery. It is ideal for deep cycle applications. Its continuous AC output power capacity is 1500 watts with 3600 watts peak surge of power. Initial AC charge takes up to 24 hours. 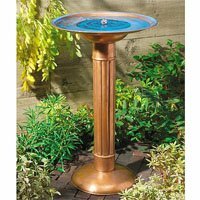 Allow up to 18 hours direct sunlight to fully charge it via solar panels only. Each solar panel is 16 watts, so it has 80W of solar panels already built in. These monocrystalline solar panels run on 17% efficiency. Sample applications include laptop, iPad/tablet, Kindle/e-reader, microwave, 3-watt LED light bulb, radio, wireless router, portable stereo, thermo fridge/warmer, TV, refrigerator/freezer, cell phone, etc. There are several other useful built-in features too. Separate solar panels and batteries can be connected for even more power. The front of the cube has two terminals for solar panel expansion, if it is needed in the future. This plug-and-play solar generator harnesses the sun�s energy and provides instant access to AC power that is fume- and noise-free. The Solar ePower Cube is ideal for use in developing countries and areas prone to hurricanes and other acts of nature. It is a good investment for personnel in the military, security field and anyone who lives off-grid. A must have item for anyone who goes camping or tailgates and barbecues. This item is covered by a 2-year limited warranty. It requires absolutely zero maintenance and no fuel costs. When you unload your groceries into the refrigerator, lay out the different items you need. Then when you have all the fridge and freezer items together, then open the doors and load them in. Usually people open and close the doors many times one at a time. This lets more cold air escape, which increases energy usage.